Previously, on MinerBumping... Agent Alt 00 quested like a true champion. She sought to find an Anti-Ganker capable of absorbing the Code and becoming a Gallant. Agents of the New Order deal with a lot of different people--it's part of the job. If you're an Agent-aspirant, good people skills are a must. They say that every time a new space lawyer is born, a GM sheds a tear. 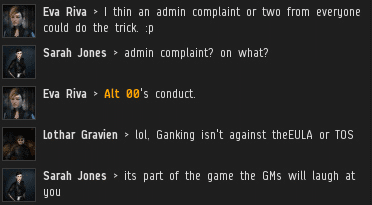 FairyKiller Blog was convinced that Alt 00's ganking activities were a direct violation of the EULA. Someone on the support team told her so, she claimed. Sure. Rebel miners have a twisted view of the world. In a carebear's eyes, even something as admirable as a medal from The Conference Elite can form the basis of an insult. Alt 00 had her hands full dealing with the children of Nakugard. A frank exchange of ideas ensued. Actually, the "exchange of ideas" was pretty one-sided. Carebears don't have any ideas. 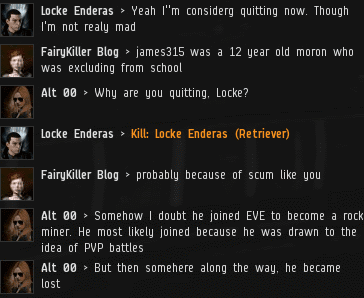 A new crisis emerged: Miner Locke Enderas was on the fence about renewing his subscription to EVE. Alt 00's priorities immediately shifted in Locke's direction--the game's player retention rates were at stake. Somewhere in Iceland, another GM shed a tear. Rather than arguing the point, Eva Riva went offline. I guess she wasn't cut out for space law. Locke came up with another silly excuse. 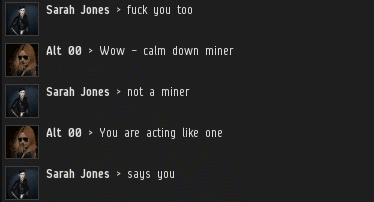 Alt 00 brushed it off and contacted the miner in private. Maybe he would be more cooperative if she got him away from prying eyes. 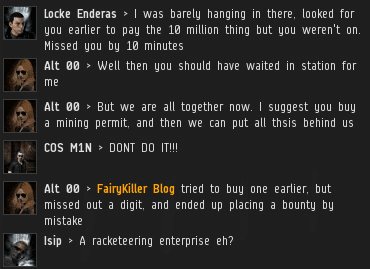 The miner sent our Agent the 10 million isk he owed her. Though he posted the permit in his bio, it contained some unnecessary disclaimers--a red flag for Locke's future. For now, though, Locke was free to enjoy the Nakugard ice anomaly all by himself. The permit-less miners had already been removed by Alt 00. The benefits of Code-compliance should have been obvious. The permit-carrying miner got to mine, while the rest of the miners could only bemoan the unfairness of life under New Order rule. The carebears of Nakugard were slow learners. Still, Alt 00 wouldn't give up her search for a Gallant. Hey Loyal, I'm guessing you're regretting trying to bully your way back into command, and throwing your "weight" around, now, aren't you? Should have stayed banned... stick to scrabble. Next up: a 6-part series entitled "The Search for our Stolen Assets". Jeezus, carebears will never learn. They never see it coming. You know, among the carebearing rebels it doesn't matter too much what the names are. The names of the Agents and Gallants shine forth in such glorious splendour, that whatever light they did produce is forever eclipsed. It's a bit like this comments section. The remarks of the Anons and randoms are just so.... weak, negative, feeble; while the contributions from the New Order are always positive, thrusting, vigorous, and sanguine. Just thought I'd lay that upon you, Brothers and Sisters in the Code! You say gallants and agents, The permit itself is a joke correct? I mean you guys have killed your own permit holders just to prove this point. So It is a scam non the less. Regardless how you guys view yourselves. Eve will always view it as a Scam. Rob Thompson, I do hope you don't role play in real life being 60 years old. Shouldn't you be collecting social security? Or sitting in a nursing home? Hey Anon, if you reach my age (hope you do!) and are not only able to look back on a life full of the joy of family and the satisfaction of professional success - but are still enjoying those things at 60+, you'll know how mis-directed those comments can be. Believe me, after age 30 or so, life speeds up a great deal, and before you know it, you're looking in the mirror - and a pensioner is staring back at you! It happens very quickly. Nevertheless, I wish you a long and happy life, wherever and whoever you are! Rob has no idea what just happened! Hmm Anon 305; there's relevant and there's irrelevant. Guess which one describes my opinion? You carebears are obsessed with money and its equivalents. 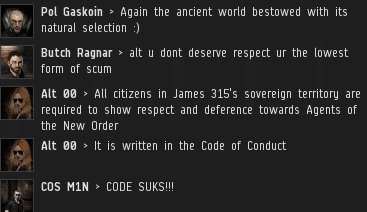 GET REKT CODE! Hisec miners WIN! \o/ You never beated us and now you got what you deserved. You lost all your assets! (500b+) BUAHAHAHAHAHAAA! And now James 315 is rage quitting BUAHAHAHAHAHAHAHAHAHAHAHAHAHAHAHAHAHAHAHAHAHAHAHAHAHAHAHAHAHAHAHA!!! 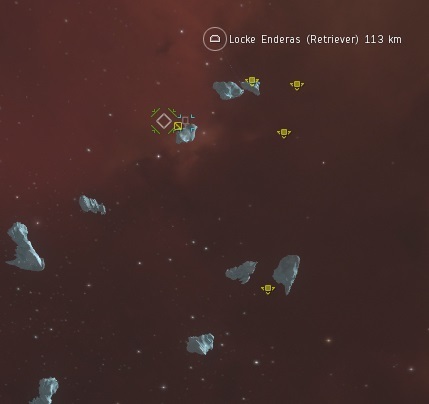 From now on every hisec asteroid belts belongs to miners and you cant do anything about it! HAHAHAHAHAHAHAAAAA!! '...beated us...', ag adult linguistic skills at their best. So Rob, you lost 500B+... not a big deal, good news is that you can start over again with an Alpha. Good luck. Hi Anon 415, my finances seem to be in a healthy state. Or did you have some other point in mind? If your intention is to taunt me, I should make it clear that I am a very difficult person to taunt, for I care little about anything in this game - except the Code! Please, don't tell us that you are not behind all this CODE scam rubbish. Of course you like it, why would not care about something you created and entertained for so long ! 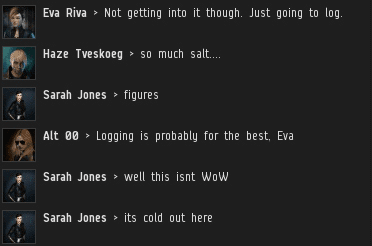 High sec is now saved... Thanks to Kusions. Can confirm with a heavy heart that code is no more. Tomorrow i will take down my beloved www.minerbumping.com and biomass James 315, Currin Trading and fivefivefour. 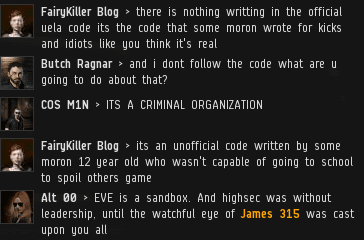 Id like to take this time to thank everyone in Code, eve and ccp for there time and for being loyal supporters to the minerbumping site. As the saying goes - All good things must come to an end. I will leave an archived version of the site up for everyone to read. He'll live where he's always lived; in the comments section, spotting fraud and ignorance and giving them the value of his observations. 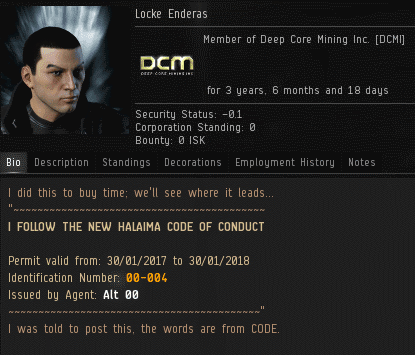 So can I finally go back to my mining without permit ?